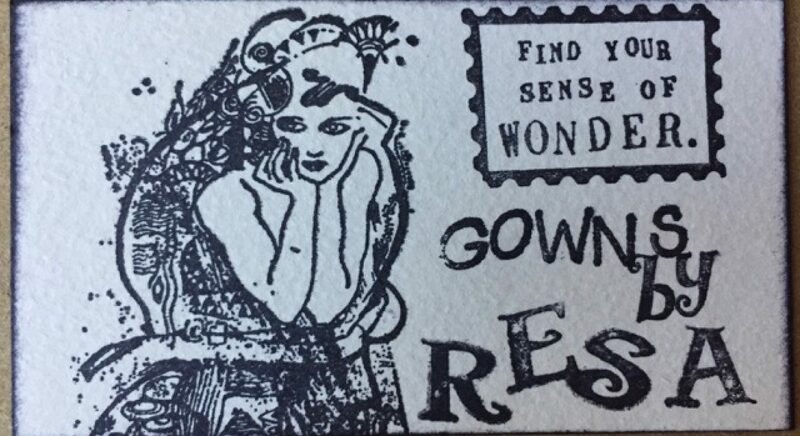 Were you ever inspired to send your Fairy God Sister something very, very special? If you have then I know your Fairy God Sister went to the hospital for a surgery that could change her life. Here is a message from Robyn. With all my heart, I thank you in advance for sending prayers out … My big day is Thursday at the NY Hospital for Special Surgery. I will be having a difficult and complex Total Hip Replacement for Congenital Hip Dysplasia by Dr. Edwin Su. I was told to expect a lengthy recovery process… but HOPEFULLY this will be the start of something VERY GOOD! 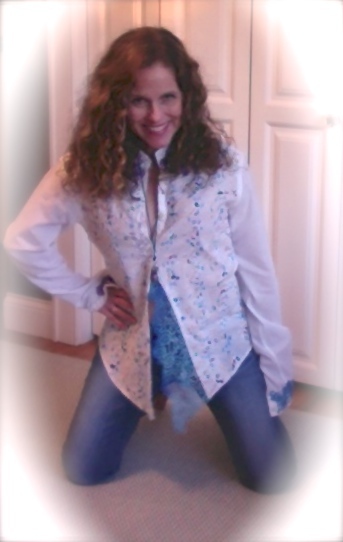 So, I sent, Robyn, my FGS, one of the Gautier “Corsets Charming” all wrapped up securely in a “Poetry Shirt”. 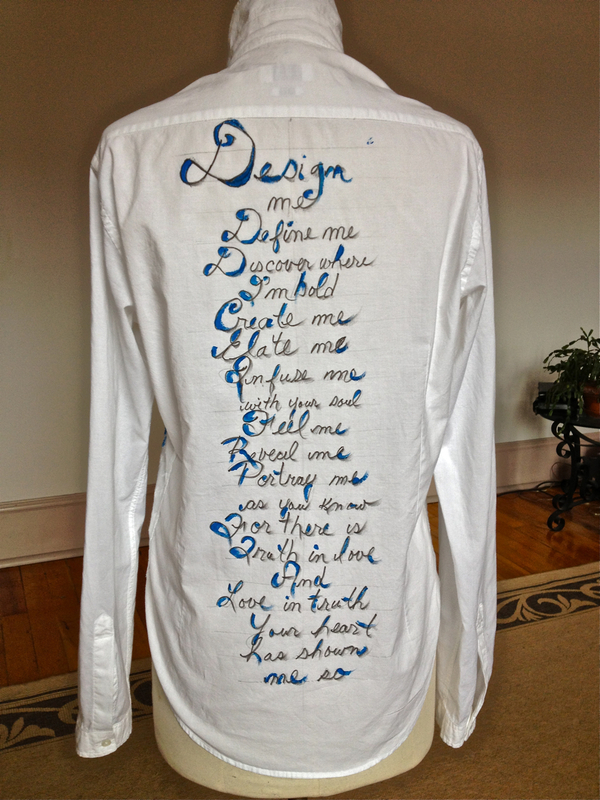 This “Poetry Shirt” is an idea we came up with as our creativity kept spilling from one to the other and so and forth. 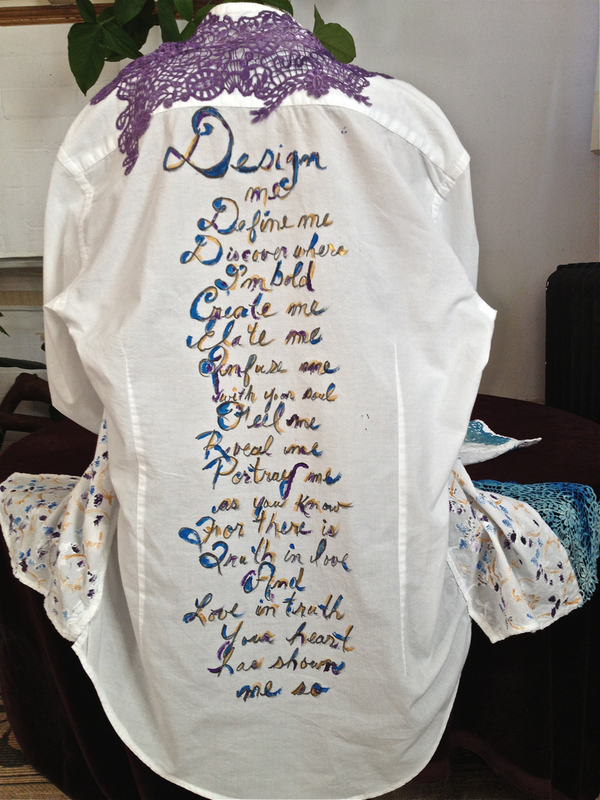 When Robyn wrote her poem “Design Me” on her Blog, THROUGH THE HEALING LENS, I was so touched that I thought, “I wish I could wear it on my body and everyone who saw it could read it and know how beautiful it is. So, I decided to write it on the back of 2 shirts, one for her and one for me. Robyn & I shopped weeks, looking for the perfect shirts which remain elusive. In the meantime I experimented with a shirt from Zara. 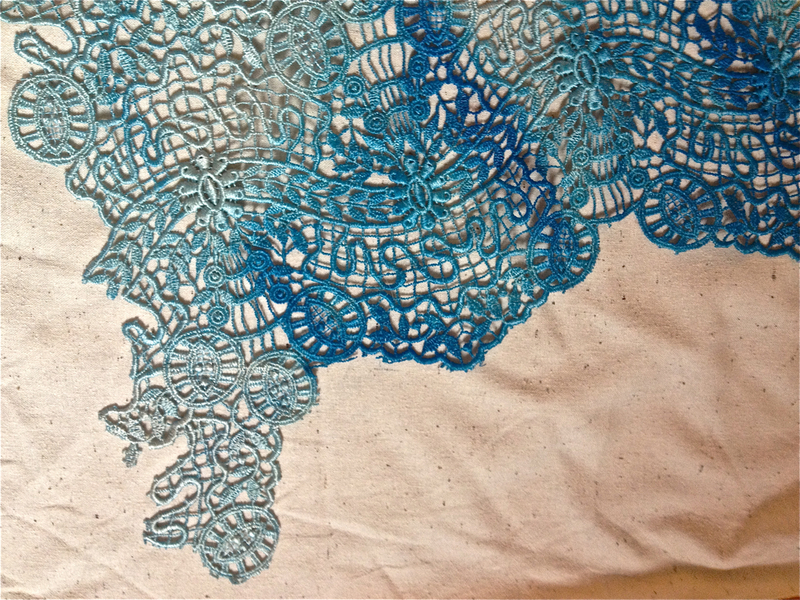 This was to be a non pressure platform for me to try acrylic paint with fabric medium, to see if I could actually write the poem, how it would wash, and to see if a shirt could look like a poem. 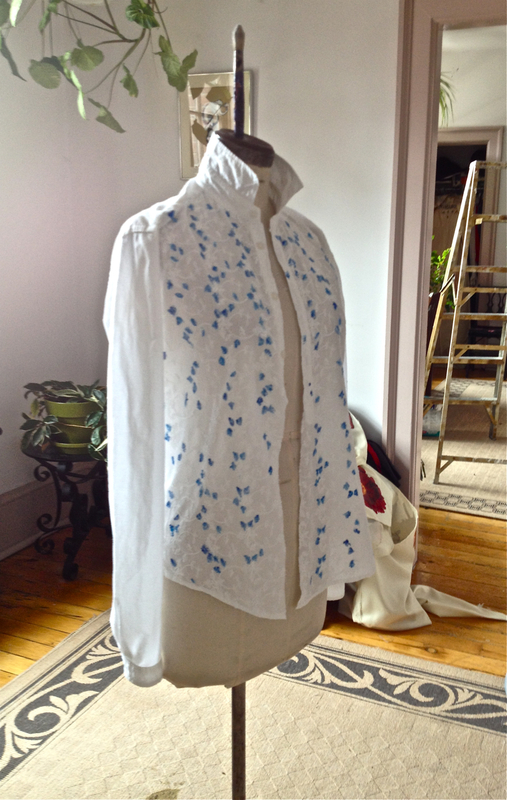 The shirt was a pullover with front placket so I cut it from the hem up through the placket creating an open front. 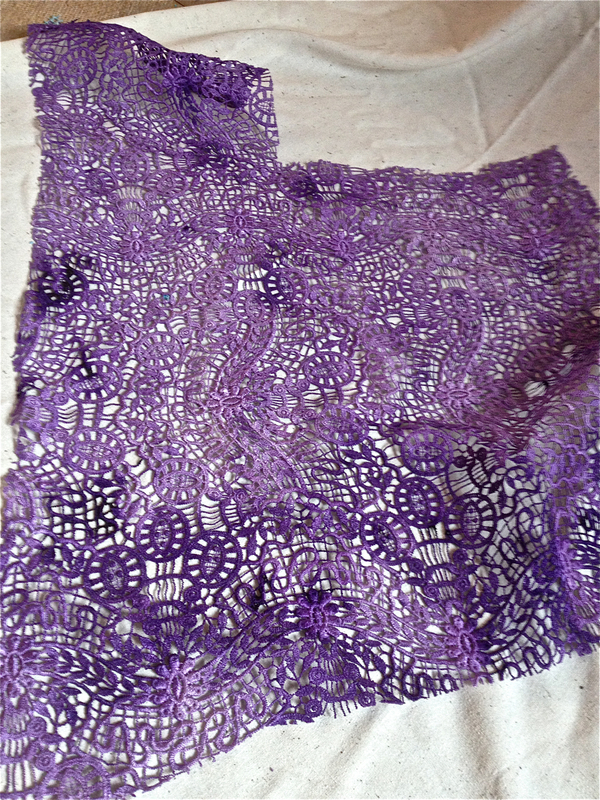 The front was embellished with white on white embroidery. It felt foreign to the writing on the back so I used the same paints I’d written the poem on the back with & brushed the front. 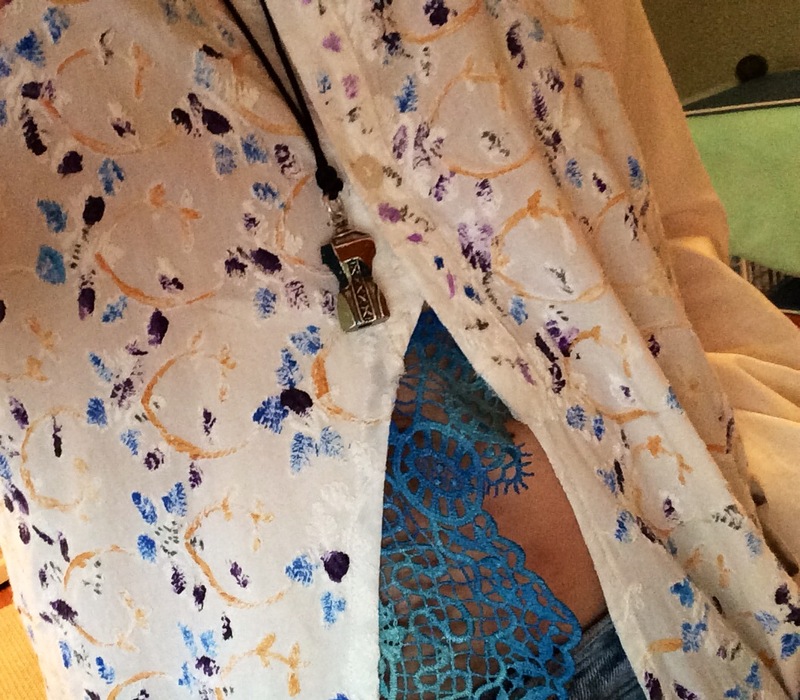 I had some of that exquisite lace I painted for “Atlantis Mermaid Love-in” left over so I conscripted it for the cuffs, collar an yoke of the “Poetry Shirt”. 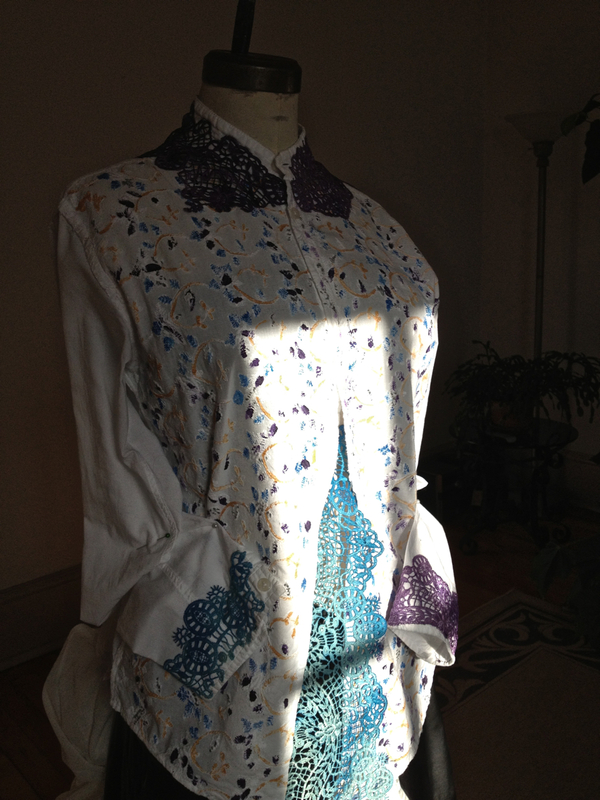 Of course I had take a few pics of the shirt in the “Art Gowns” rooms. In the end, Robyn herself is the best model. 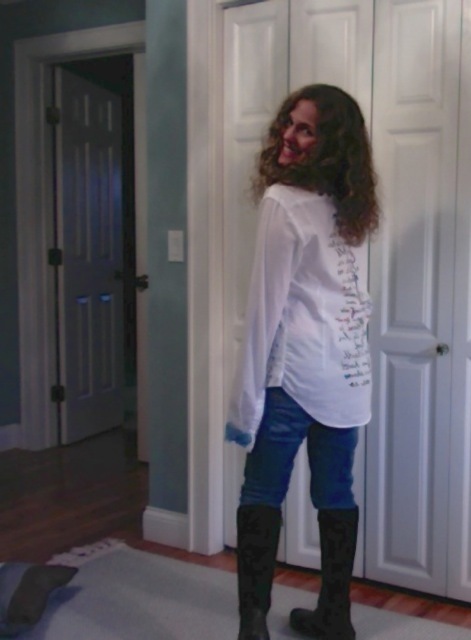 I’m thrilled to have pics of Robyn in the “Poetry Shirt”! Robyn misses her WP family, and wanted to apprise us on her Blog. 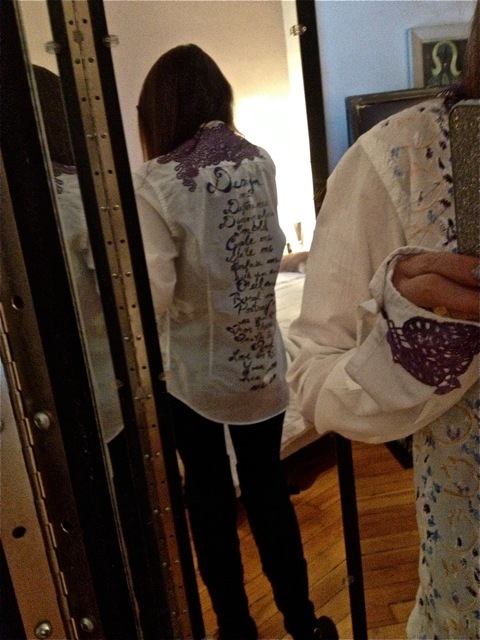 However, Robyn is not in a position at the moment, but has told me I could go ahead with the first “Poetry Shirt” post. The plan here is when she recovers from all this there will be more better pics & a second look on THROUGH THE HEALING LENS. A lot of positive energy, from many loving souls, will be sent into the universe. I send All My Love to Robyn.